Of the many pressing questions raised by the Rachel Dolezal circus that was wrapped in a trainwreck and dipped in a forest fire, one of the things that stands out most for me is: How did she get her hair so on point? Black people come in all shades, but clearly Rachel knew: Those spray tans would not be enough. The hair—she had to nail the hair—and boy did she. This is not to say that all black people have the exact same hair texture. However, it would be a lie to say that hair texture doesn’t play a role in determining a person’s background. The hair was crucial here in large part because Rachel Dolezal was trying to pass as a black person with light skin. If she had kept her hair like this and just waved her Africana Studies curriculum around, people weren’t gonna buy that. No, Rachel had to dig deep. She had to get the hair right to pull this off and boy did she ever! Here is Rachel giving a lecture about the history of black hair. MY GOD THIS WOMAN WAS IN DEEP. Rachel Dolezal is clearly on #teamnaturalhair. Look at the precision of those coils. The shape of that cut. Somebody has been searching “natural hair” on Pinterest. There is a term used by those of us in the community called shrinkage. When many black women wet their hair, it appears to be longer than it does when dry because the curl pattern usually retracts into a tighter curl after it has dried. We call this shrinkage. Clearly Rachel knew all about shrinkage. Now, Rachel Dolezal is not the first white woman to get box braids, ALTHOUGH SHE SHOULD PROBABLY BE THE LAST. The fun thing about Rachel’s hair journey is that she experiments with her looks. Image via Nicholas K. Geranios/AP. My favorite Rachel Dolezal black hair moment is when girlfriend broke out the HEADWRAP—looking like a lighter version of Erykah Badu. This is damn near a street style shot at Afropunk. I just have to give Rachel’s coils one more shoutout. 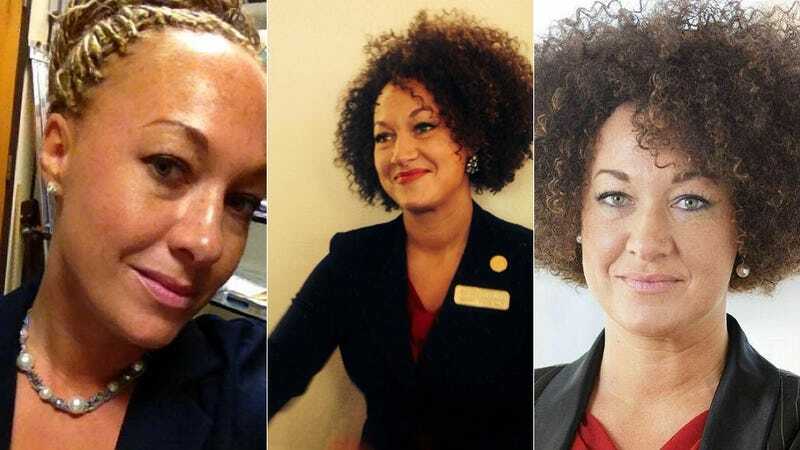 When Rachel Dolezal committed, she really committed. Here is Rachel with very long faux dreadlocks. That’s how you know she was in this for real. This woman went out and got arguably the blackest hairstyle possible and then multiplied it by five. She is swimming in locs. Look, I can be mad at Rachel Dolezal about a lot of things, but I can’t be mad about her hair game. Rachel, girl, YOU DID THAT. Images via Rachel Dolezal’s Facebook.